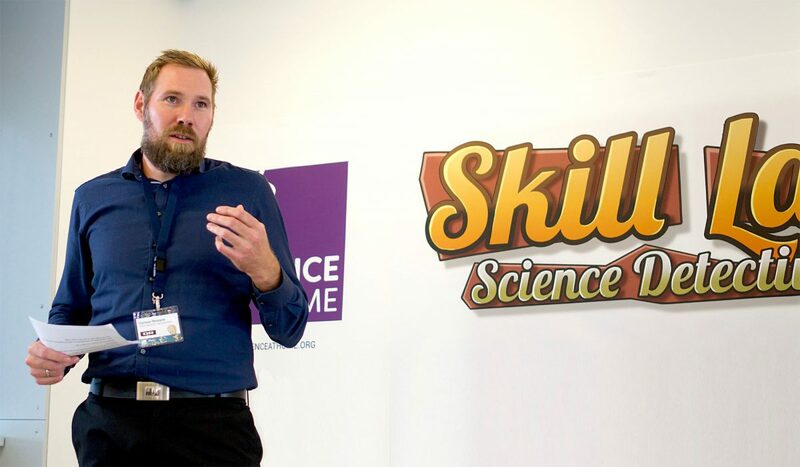 In collaboration with DR - Danmarks Radio (Denmark's oldest and largest electronic media enterprise), we recently celebrated the launch of Skill Lab: Science Detective, our latest Citizen science game. The launch of the game also coincided with DR promoting their new initiative 'Denmark’s new super brain'. "Algorithms are on the doorstep, computers are already outperforming humans in many tasks and robots are replacing muscle power. The uptake of technology is overwhelming. However, humans are still very unique in the way of decision making. 'Denmark's new super brain' is a project where researchers through computer games explore human intuition. The goal is to create a new artificial intelligence that complements and supports humanity." Carsten Nymann, Director of DR Videnskab (DR Knowledge - DR). Our project would not be able to progress without the support of players and partners such as DR and the Carlsberg Foundation. DR is playing a key role in helping us reach as many people as possible in Denmark, to drive awareness of our Citizen science games and research. ScienceAtHome is an international team with a global player base, but with Denmark, as our home, we are especially proud to be able to present Skill Lab: Science Detective on DR's website alongside ScienceAtHome.org and mobile platforms. Science can be a complicated story to tell and presenting complicated concepts often carries a risk of losing the attention of the audience. DR has taken up the challenge to present science as accessible and cool. How can we bring science closer to people? "By letting them participate in the research." - says Carsten Nymann. During this year of science, DR is sharing games and science stories encouraging the audience that science is a world worth exploring. In Skill Lab: Science Detective you are generating scientific data from the first click. In return for your gameplay, you'll get your cognitive map. At the same time, you are also donating your data to a database which is building a model. In the game, we are measuring basic brain functions like reaction time and memory. Behind the game, we have a model that connects brain functions with the behavior in the games. The more people play, the better this model becomes. It might feel a bit uncomfortable to share your data for this research project with our group. However, you might already share much of your personal data all the time. On Facebook, in games, and on Google personal data is collected all the time and used for maximizing the company profit. In Skill Lab, you can be part of a bigger project to find out who are we as people. With the shared data, you can find out who you are as a person and we can also answer bigger questions regarding humanity. For example, what happens as the brain getting older? What's the difference between a young and an older brain? ScienceAtHome has been involved with Citizen-driven science for several years, cultivating collaboration between researchers, game developers and visual artists in order to create enjoyable games, enabling everyone to contribute to cutting-edge research. The team at ScienceAtHome is dedicated to providing entertaining games that can deliver reliable data for scientists and comply with strict data protection regulations. It's a challenging task. A campaign like 'Denmark's new super brain' is a great accelerator to get people involved. We hope to involve more and more citizens in research and let them form the future together. Knowledge creates us. "The future is a scary place but empowered by knowledge, we can be more confident, enlightened and wiser than expected" - says Carsten. You can help us make a difference. More than 7000 people have already played Skill Lab: Science Detective, come and join them and help us to understand human cognition better.